I've just attended my first ever CukeUp conference, that is given by Skillsmatter each year. It's organized by Aslak Hellesoy that created Cucumber five years ago. It attracts a nice audience and community that share a lot of interest with me. For me it was extra fun to meet some of my heros and friends that I've followed and interacted with for quite some time (Matt Wynne and Gaspar Nagy to mention a few).As always at conferences the learning is plentiful, even though my focus and nervousness was at my talk for a few hours. I especially like Matt Wynnes talk on Cucumber Pro Tips. There's two excellent books (The Cucumber Book and Cucumber recipes) that Matt and friends has written that contains loads of tips and pragmatic hands-on descriptions for any Cucumber user. His talk was an extract from the books.The biggest thing that stuck in my mind was: push HOW down. He has been talking about that before (very funny here) to great effect in this excellent talk called "BDD - as it was meant to be done!". That point was then something that run through almost every talk (including my in fact) on the conference. At least the once that I heard so far. I've just attended my first ever CukeUp conference, that is given by Skillsmatter each year. It's organized by Aslak Hellesoy that created Cucumber five years ago. It attracts a nice audience and community that share a lot of interest with me. For me it was extra fun to meet some of my heros and friends that I've followed and interacted with for quite some time (Matt Wynne and Gaspar Nagy to mention a few). As always at conferences the learning is plentiful, even though my focus and nervousness was at my talk for a few hours. I especially like Matt Wynnes talk on Cucumber Pro Tips. There's two excellent books (The Cucumber Book and Cucumber recipes) that Matt and friends has written that contains loads of tips and pragmatic hands-on descriptions for any Cucumber user. His talk was an extract from the books. The biggest thing that stuck in my mind was: push HOW down. He has been talking about that before (very funny here) to great effect in this excellent talk called "BDD - as it was meant to be done!". That point was then something that run through almost every talk (including my in fact) on the conference. At least the once that I heard so far. The main point is this; specification by example is way to clarify how the system should behave by using concrete examples. This can be done before any code is implemented and can clear out a lot of misunderstandings and misconceptions that have you go back and forth later in the process. Cucumber / SpecFlow can then be used to execute these scenarios, written in natural language, against code that flex your system to verify that the system behaves as expected. the implementation is taking place already, HOW the system is to be implemented is shining through ... but that's not really the intent now is it. it's almost impossible to see the "tree for the forest". What is this scenario describing? it clearly shows the (in this case very simple) behavior. It's understandable by everyone, even non-techies, even techies. But the second version doesn't say anything about HOW the system or even the automation is done. That's just what we wanted but where did the HOW go then? 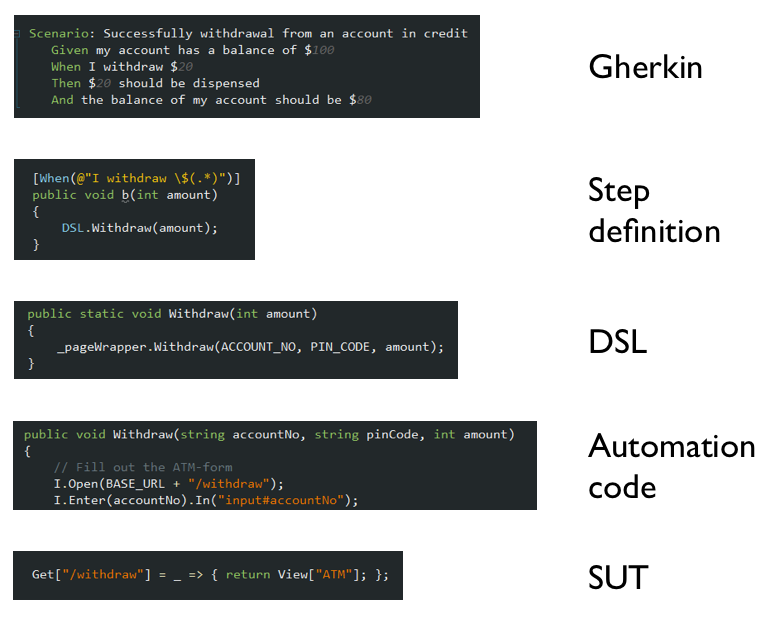 This is the method that get's called by Cucumber/SpecFlow as the scenario is executed. Great you think - let's keep the HOW there. Let's write automation code there and start interacting with our application. Well - no... keep pushing, if you believe Matt Wynne (and you should!). Try to keep your step defintion as simple as possible, preferable one-liners. These one-liners can interact with a DSL or Driver object that you use to interact with your system. 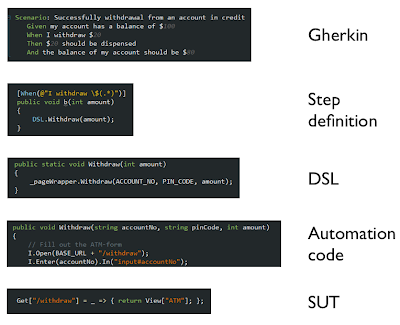 This DSL is written, by you, especially for the step definition with test maintainability in mind. Matt talks about this in both his books and to great effect in this talk (and a bit more rude in this one) as I told you before. But, what does that Driver/DSL-thingy look like then? The DSL is just a simple object that you write yourself that interacts with your system under test. As you write this you can make up the structure for it as it suits your need: coding by wishful thinking I've heard that it's called. Make it useful for you - you make up the API for your purposes. The DSL sets up data in the database (or in memory versions of it, or creates mocks), interacts with the system by executing the commands you're testing and finally does the assertions of the state of the system after the command is executed. You should change this DSL/Driver object to suit your needs as your scenarios evolves. For example, from the start you might just need a couple of methods directly on the Driver object (Driver.WithDrawAmount(int amount)) but after a while you might want to expand it with sub-objects, overloaded methods etc. Give the DSL a lot of love. This is also code. It can (and should) be given the same attention as the production code. You could even write tests for it on the unit level. If you don't maintain it you stand the risk that it rots, as all code does. Now wait a minute... I still don't see the HOW?! At least not if we're supposed to interact with a web page. Where is it? No - that's right. The DSL above is an example of using the driver pattern. Most often we hear about this in the form of the Page Object Wrapper that I've blogged about before. While this is a great idea I think that the DSL/Driver constructed above is better. It becomes a higher level Driver, that contains the Page Objects you might need. If you don't have a higher level Driver you'll need to orchestrate how you call between the different pages right in the step definitions, making them more complicated and harder to maintain. A DSL/Driver object that in turns calls into the Page Object is a much better, and more maintainable solution, in my opinion. Conclusion and "was that really necessary?" Gherkin - the business readable scenario with focus on behavior. No HOW in here. DSL/Driver - the object that you write that interact with the system under test. Sets up data, interacts with the system and asserts the outcomes. Might interact with Page objects/drivers in turn. Automation code - driver objects that performs the HOW (finally) in the interaction with the system. Enters input, reads and asserts values back from the system. Web page automation is found here. It's not suitable for a single feature that you might throw away at the end of the sprint. But if you will maintain the tests over a period of time it will pay off. Tests that is hard to maintain will eventually not get run. Its a law of nature. If you don't run your tests you have not only wasted the effort you put in writing them at the first place, you also waste an excellent opportunity to catch bugs and inconsistencies early. I find this structure very helpful and I hope you do too.